← In honor of Pi day…zombie pie! April is an important month at work, because it is Parkinson’s Awareness Month (PAM). This is only my second PAM while working at the Parkinson’s Disease Foundation, but I’m trying to make it a habit to show my spirit by bringing tulip-themed baked goods into work during the month of April. Last year, I made these tulip-shaped sugar cookies. This year, I decided to make a pie, since I recently learned a great technique for rolling out dough–roll it between two pieces of plastic wrap! It comes out perfectly and there is no sticking to the rolling pin. I brought my pie in yesterday (the last day of April) and it was a big hit! Why tulips? Read about the tulip as a symbol for Parkinson’s disease here. I saw this photo online using star shapes, and thought it would be perfect to make using my tulip cookie cutters. 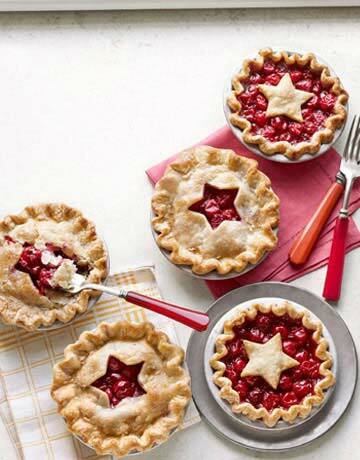 I love the idea of the inverse shapes, and would have done this if I were making two pies. I decided to do a mixed berry pie (strawberries, blueberries, and blackberries). While it tasted great, I think the effect would have been better with just one berry (probably blackberries since they are dark). But, overall I was happy with the end result. Basically I rolled out the dough for the bottom crust and placed in the pie dish. Then I filled the pie and rolled out the top crust. Before putting the top crust on, I gently made an indent with the cookie cutter in the middle of the dough, but did not go all the way through. After placing the dough on top, I put the cookie cutter in the same spot and pushed down all the way. Then I gently removed the tulip-shaped dough and went around the edges with a butter knife to smooth it out. Wrap in plastic wrap and refrigerate for at least 30 minutes but can be left in the fridge overnight. Sprinkle ¼ of the mixture onto the bottom of the rolled out pie crust in the pie dish. Reserve another ¼ of the mixture for the top. 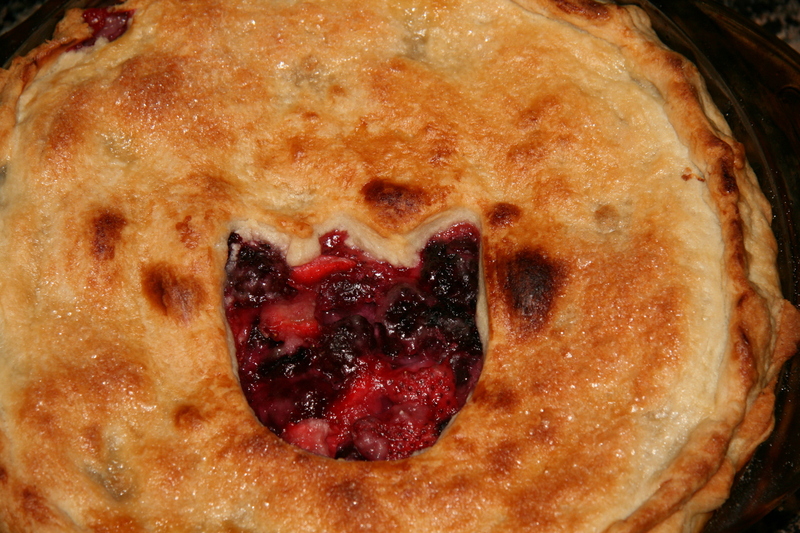 Mix the remaining flour and sugar with the berries and place in the bottom crust. 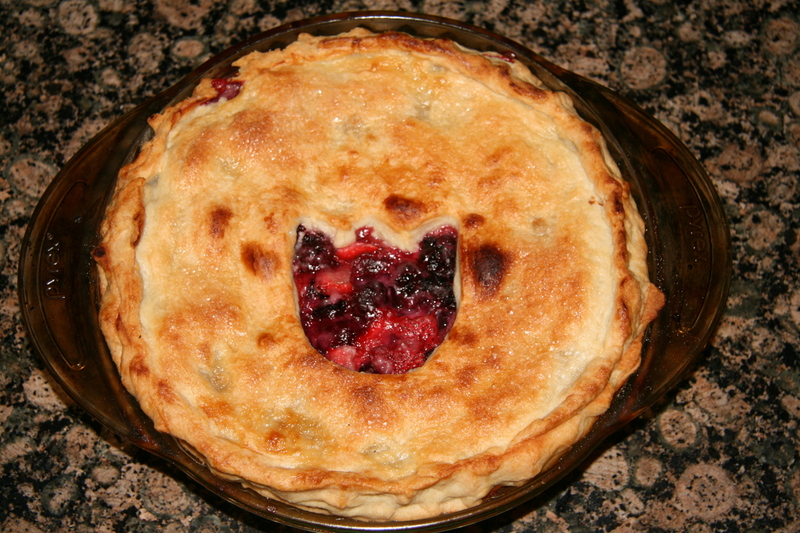 Sprinkle the reserved flour and sugar over the berries and place the second pie crust on top. Cut away excess dough and crimp the edges of the top and bottom pie crusts together. Bake at 425 degrees F for 15 minutes and then turn down the oven to 375 degrees F and bake for an additional 20-25 minutes. Parkinson’s Awareness Month may be over, but it is always a good time to show your support. Parkinson’s disease is a neurodegenerative disorder that affects movement and currently has no cure. If you would like to learn more about Parkinson’s, or donate to the Foundation’s efforts, please visit www.pdf.org. This entry was posted in Logo Work, Other Desserts. Bookmark the permalink.